As coaches we sometimes become anxious to jump into youth baseball hitting drills because we know the difficulty of teaching and learning the art of hitting. However, sometimes we put the cart before the horse so in this segment we’re going to begin at the Beginning … the Stance. We’re not going to discuss open or closed stances, hands low or high, nor starting mechanisms for the feet and hands. 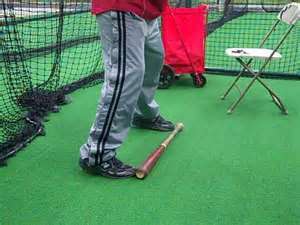 We’re going to describe and explain the Basic, Elementary Batting Stance, where all young ball players should start at. The Beginning: Where do you start? (4.) 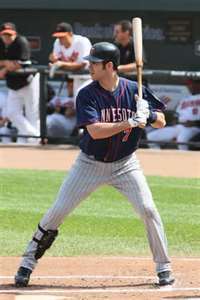 The front hip and knee are pointing, or square, to the pitcher. (4.) Provides the best plate coverage. (5.) Provides the best chances of the hitter keeping his head down on the ball instead of pulling it off. (4.) When the front shoulder lifts, there is a tendency for the player’s head to follow, which has him pulling his head and eyes off the ball. 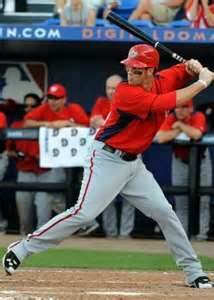 The proper basic elbow placement is to have your hitter form a Triangle with his two elbows and hands. The two elbows form the bottom base and angles, the hands the top. This hand and elbow placement produces a level and quick bat to ball swing. (3.) The bat doesn’t stay in the hitting zone long enough; it enters late because it’s approaching from under the hitting zone and exits quickly because it’s upward arch takes it out of the zone. (4.) 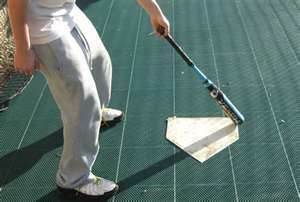 Dramatically increases the chance of hitting the Bottom of the ball, which produces fly balls. We all know fly balls result in outs more than ground balls. (5.) 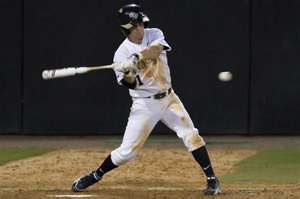 The reduced time the bat is in the hitting zone means the chances of making contact with the ball is greatly reduced. For young hitters I’d use the comparison of throwing the baseball to hitting the baseball. You must bring your arm back first, then bring the arm forward as you throw the ball. From a toddler a human has a natural physical ability to throw an object, maybe not very well or far, but the arm motion is there and easy to understand. (4.) All of these items will prevent a hitter from being able to compensate and hit a change-up or any kind of breaking pitch. What the well meaning coach or parent means to say is “Shift your weight.” As stated earlier, a hitter must go back, which allows the hitter to store kinetic energy, before going forward, the release of the energy. (4.) Placing his front foot back down, the weight begins to transfer forward and if the pitch is a strike, a hard swing is initiated. We’ll stop our lesson here and although it may seem premature because there’s so much more to learn, but remember who you are teaching. Teaching a bit too little with complete understanding is much more beneficial than presenting so much information it produces an overload mindset which creates confusion or the mind’s complete erasing of the lesson. I promise to use it only to send you Sports Tips.